Think of the spiciest thing you’ve ever eaten. Now imagine spicier. When you first survey the short menu at Killer Noodle Tsujita, along the main drag of Sawtelle Japantown, you’ll notice a page of rules titled “Killer Noodle Tsujita: 7 Fundamentals,” which begins with a warning that the food can be “painful” and ends with a warning to “please take care of your bottoms.” There are also suggestions on how to prepare for the fiery onslaught: a side of chilled yogurt, a moist face towel, a plastic bib. You’re probably familiar with the acclaimed pork-bone ramen at the original Tsujita locations a few doors down, but Killer Noodle—the chain’s latest expansion—is another beast altogether. The specialty here is a Japanese interpretation of spicy Chinese dan dan noodles, drenched in a glowing red sauce made from, among other things, ground sesame, dried chiles, and sansho pepper (the Japanese cousin of the numbing Sichuan peppercorns). When ordering, you’re asked to customize your bowl. Do you want noodles in broth or a thick sauce? How much heat can you handle? The scale is from zero to six, and heaven help you if you ask for six. For the majority of us, level three achieves the Goldilocks effect—a steady but mellow burn, tempered by a splash of vinegar, ground pork, and crushed cashews. Your bottom will thank you later. 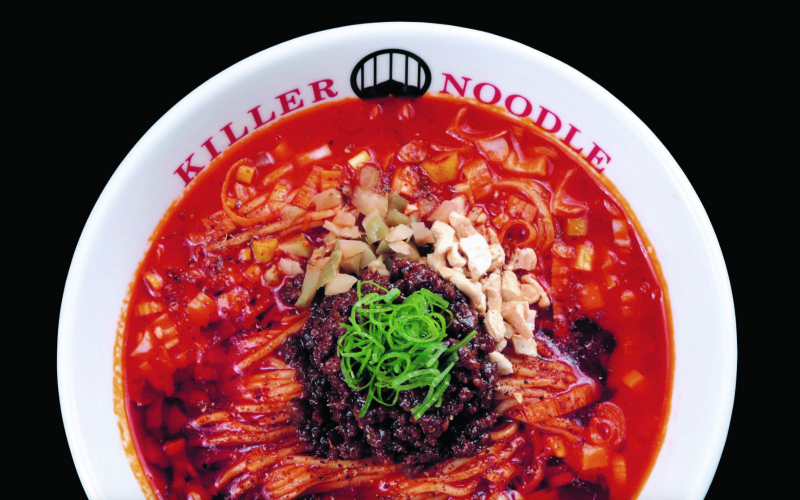 Killer Noodle, 2030 Sawtelle Boulevard, West L.A.